A few years ago, I read a book called The China Study which talked about the effect of diet on major health issues such as heart disease, cancer, and diabetes. If you haven’t read it, and are interested in how our food affects our health, I would highly recommend it! The reason I mention it is that there have been various book and documentary spin-offs since then, including the Forks Over Knives film/book/cookbook. Forks Over Knives is predominantly a vegan advocate, but for some reason the vast majority of the recipes in the books are gluten free. The main substitution I have to make is for soy sauce (for which I use Braggs aminos and reduce it to 1/2, though you could use a wheat free tamari if you wanted to). Anyway, most of the recipes are also very simple; there are very few recipes for, or using, bread, or pancakes, or tortillas, but if you’re after easy plant based meals, you might want to take a look. The following recipe is from Forks Over Knives (The How to Companion, not the Cook book), and demonstrates exactly what I mean by ‘easy’. Don’t be fooled by the simplicity of this recipe, however. The walnut sauce really is very good with lightly steamed greens. Good enough for guests …. providing you ever have guests who’d eat steamed greens. Personally, I think it’s a treat. Put all the ingredients in a blender (or immersion blender beaker), and process until smooth. Check for seasoning. That’s it. See what I mean about the recipes being simple? Being gluten free, dairy free, and vegetarian tends to make it difficult to eat when going on vacation. When we headed off to Florida at the end of May, we stayed in a condo, so I could cook if necessary. One of the dishes I went prepared to make was this cashew based pasta sauce, because it’s fast, easy to make, and requires little in the way of fancy kitchen equipment. I took a few supplies which could have been tricky to get hold of (including nutritional yeast), and was delighted to find that the condo was equipped with a cheap blender which had probably only previously been used for making margaritas …. except that it didn’t work, and it took housekeeping nearly an hour to get a replacement, so the cashews got to soak for quite a while before I blended them. You won’t need to wait for so long, but if you have the time to soak the cashews, it certainly wouldn’t hurt! 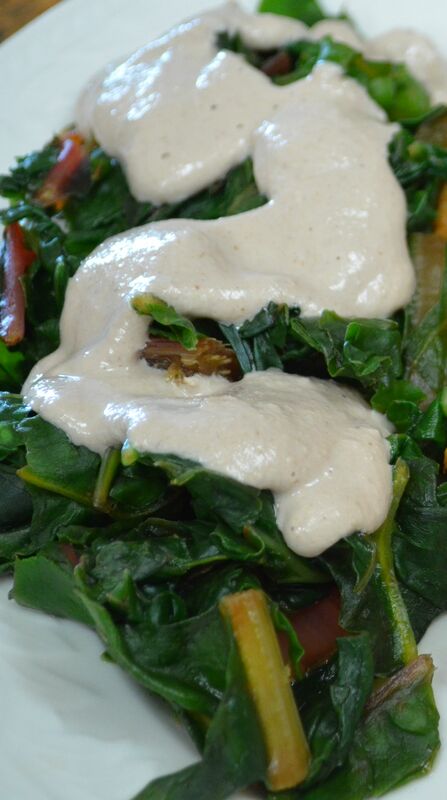 This recipe is an adaptation of one from Miyoko Schinner’s Artisan Vegan Cheese. The recipes in this book look gorgeous, but I’ve only managed to execute one of them so far, as most of the others require an ingredient called rejuvelac, which I’ve attempted to make 4 times, but not been confident enough about the outcome to use. I’m not giving up, though; I’m just starting. Anyway, the adaptations I made to this recipe were because a) I don’t have a high speed blender, so I have to be more careful about how I tackle blending sauces, and b) as a relative newcomer to nutritional yeast, I tend to need to moderate recipes developed for/by seasoned vegans. Nutritional yeast is an acquired taste. It’s quite delightfully addictive after a while, but I haven’t yet got to the stage where I want to use 1 tbsp per serving in a recipe. 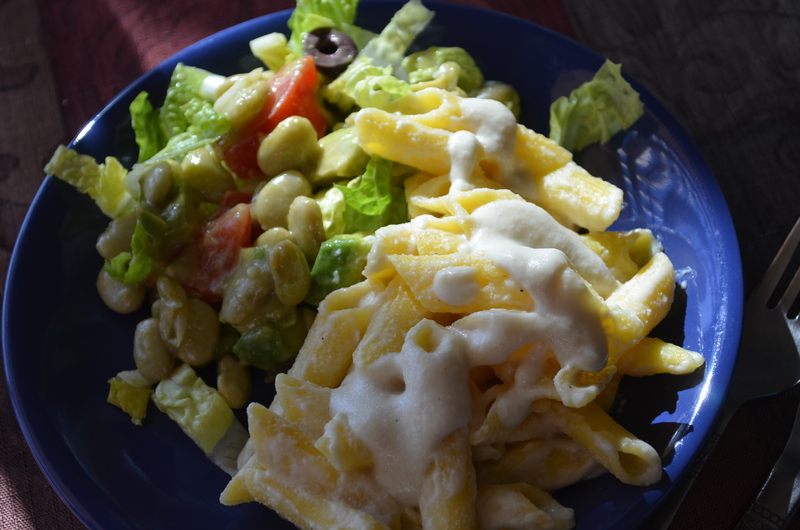 I fed this alfredo sauce to some of our omnivorous friends yesterday, and they liked it too. Be sure to use fresh garlic. If your garlic is starting to stink, it will be really obvious here. As a last aside: make sure that you like the wine you use for this. If you wouldn’t drink it for pleasure (or at least find it acceptable), then you probably won’t eat it for pleasure either! I know this from experience! Put all the ingredients in a blender with 1 cup of water. Optionally, allow to soak for 1/2 an hour before continuing. Blend until the mixture starts to thicken. Keep blending, and gradually add another 2 cups of water as the mixture continues to thicken, adjusting to keep it thick, but not so thick that the blender can’t do its job. Continue until all the water has been added, and the sauce is smooth. Scrape the sauce into a saucepan, and gradually bring to a simmer. Simmer gently for about 5 minutes, stirring frequently, until thick and creamy. Check seasoning. This sauce is sufficient for about 1 lb of dry GF pasta, cooked, and serves 4-6. 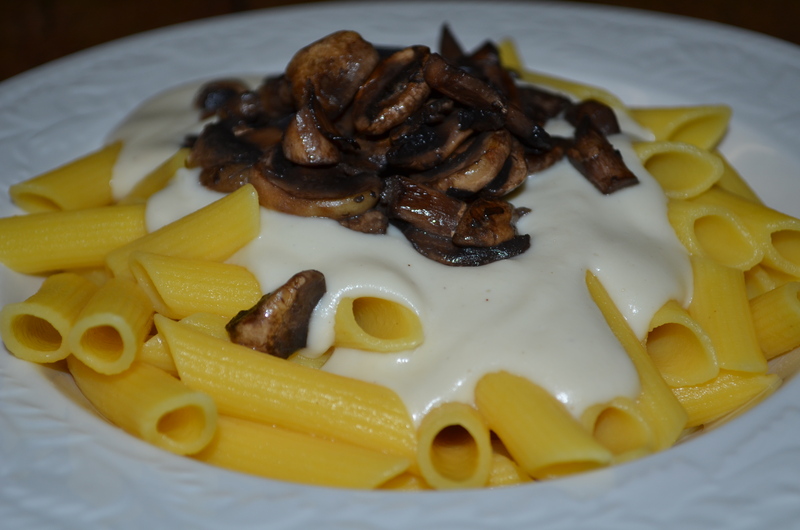 Variation: Thickly slice 1lb of mushrooms, and fry in 2 tsps oil or margarine, sprinkled with 1/4 tsp salt until brown. Either stir into the sauce before serving, or pile on top. I’ve also enjoyed pasta with alfredo sauce on a bed of lightly steamed (~ 2 minutes and then well drained) chard. About 1 – 1 1/2lbs of fresh chard would work for this amount of sauce and pasta. My husband loves eggplant, so I set to, to make moussaka last night. I use the following sauce to top lasagna and moussaka, as it browns well, and doesn’t dry up and crack in the oven. I’ve made it using both almonds and cashews (on separate occasions), and both work well. I felt the almonds especially needed to be allowed to soak for a little while to soften before the final blending, so make this sauce such that it can sit and wait for about 20 minutes before being used. The final product is mild in flavor, and it takes kindly to flavor variations, if required. If you want to use the sauce to top a baked dish, you can add an egg to the warm (not hot) sauce before using in the bake, so that it solidifies in the oven to make a cohesive layer that stays on top of the bake. 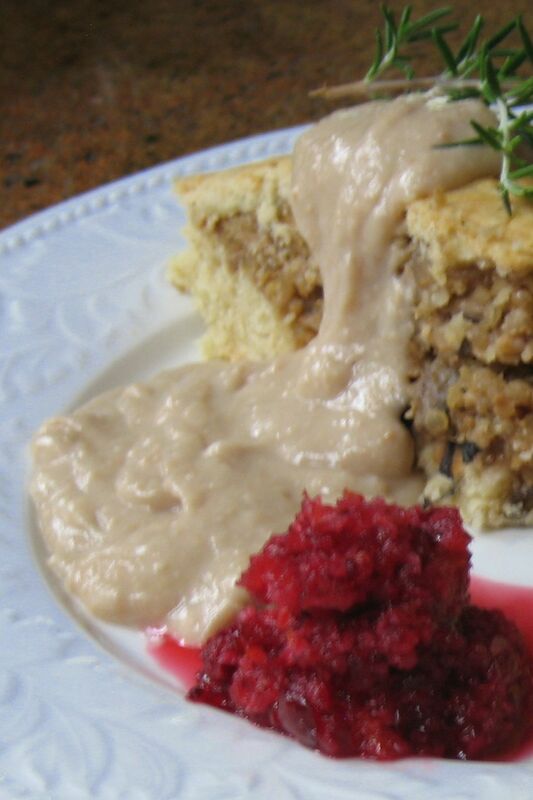 For vegan moussakas and lasagnas, you could either add another tbsp or two of starch, or bake in individual serving dishes so it doesn’t matter if the sauce is liquid. I’ve recently been branching out in the brands of miso that I buy. The miso you need here is a light, rich, almost cheesy one. My favorite is still the chickpea miso from South River, but I’m starting to look at other less expensive varieties. Misos vary in the amount of salt they contain, so you’ll need to adjust the amount of salt you add to accommodate that. This sauce makes enough for 2 generously, 3 reasonably, or 4 for folks keeping an eye on calories. It makes a thin layer for a medium sized lasagna/moussaka, so double up if you like a thick layer, or want to make a larger dish. The kids gave it two thumbs up. 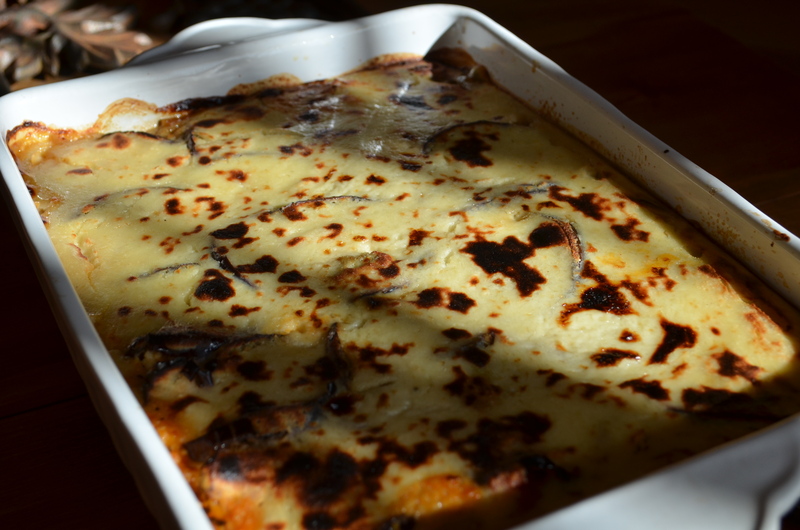 White nut sauce topping a mushroom lasagna. Mix the cashews, nutritional yeast, and cornstarch in a saucepan and gradually add the liquid, stirring with a whisk. Stir in the other ingredients (except the egg), and bring to a gentle boil, whisking until thickened. If using the egg, allow the sauce to cool for 5 minutes or so before adding, as you don’t want the heat to cook the egg at this stage. Use an immersion/stick blender to smooth the texture if necessary. Check for seasoning before using. This is my de-gluten-ized, simplified, and tweaked take on a ‘Punk Rock Chickpea Gravy’ from Iza Chandra Moskowitz’s Vegan with a Vengeance. I thought it might be a bit too vegan-esque for my husband, but apparently I was wrong (to the extent that I now make this every Sunday). The girls have also had it numerous times (without the cumin) over mashed potatoes (white, and sweet potatoes on another occasion), and it went down a storm. I managed to slosh 1/2 a glass of white wine in it on New Year’s eve, and that was rather good too. 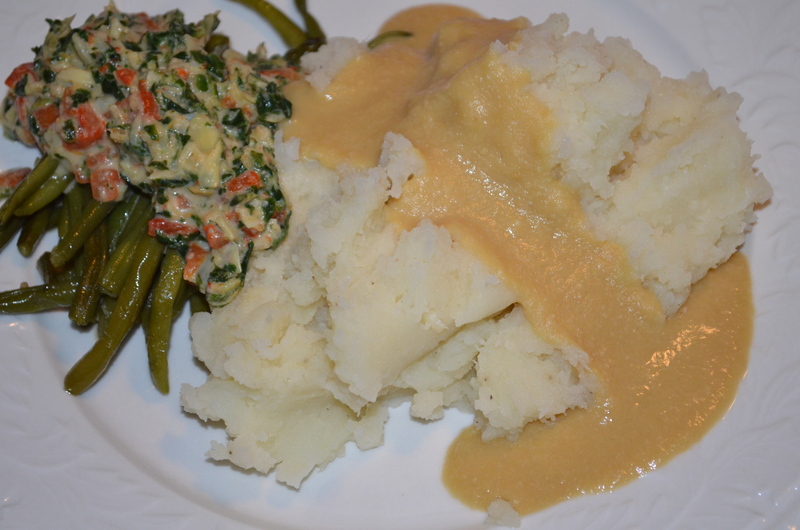 Chickpea gravy (blended smooth), with garlic mashed potatoes, garlicky green beans, and artichoke and red pepper sauce. The quantities here should serve 4, if folks aren’t drinking the stuff! Make sure the chickpeas are soft before adding them; some brands of tinned chickpeas are a little too crunchy. Gently sauté the onion in the fat until softened. Add the garlic, and warm through for a couple of minutes. Stir in the cumin (if using), nutritional yeast, almond flour, and garbanzo beans. Once the almond flour has absorbed the Earth Balance, gradually stir in 1 cup (8 fl oz) of water. Stir in the lemon juice, Braggs (or other gluten free soy sauce), chickpea miso, and pepper. 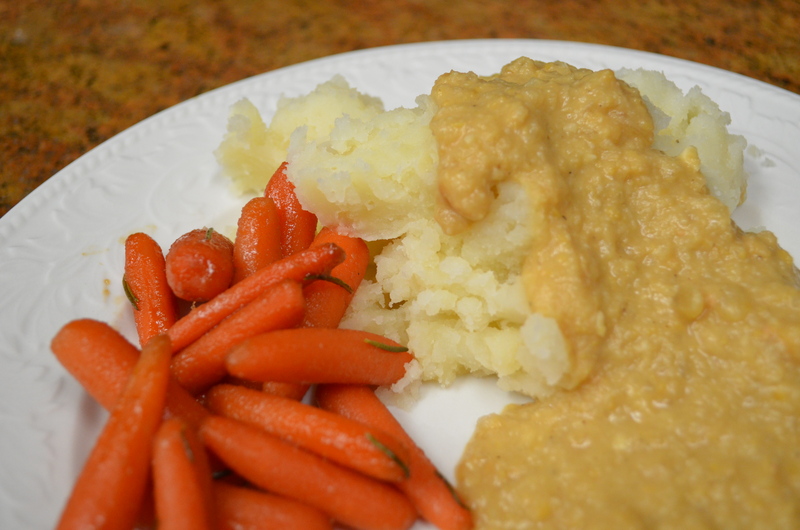 Chunky chickpea gravy with garlic mashed potatoes and seared sweet cider carrots. Partially or fully blend with an immersion blender. Adjust thickness – up to another 1/2 cup (4 fl oz water), and seasonings, if necessary. Cranberry and Orange Relish for Formal Occasions; this is not sickly sweet; it’s for the grown-ups. Borrowed from Joy of Cooking; this needs no adjustment. It is a fabulous raw relish to serve at a formal meal with roast potatoes: sweet and tart all at the same time, this is a wake up call for your taste buds. Any left overs are great, thinly spread in sandwiches, and it freezes very well. I make it towards the end of the year when fresh cranberries are in the stores, and freeze it in small serving bowls ready to pull out and put on the table at any formal occasion. You can also make it just 4 days ahead of time, and leave in the fridge while the flavors meld. Put the orange in the food processor (yes, skin as well), and pulse once or twice. Add the rest of the ingredients to the food processor and pulse until the cranberries and orange are evenly chopped to pieces no bigger than 1/8-1/4″ thick , but not pureed. At this point, it looks a bit dry, and tastes raw. Let sit in the fridge for 2-4 days to allow the flavors to blend, and the sugar to dissolve in the juices. 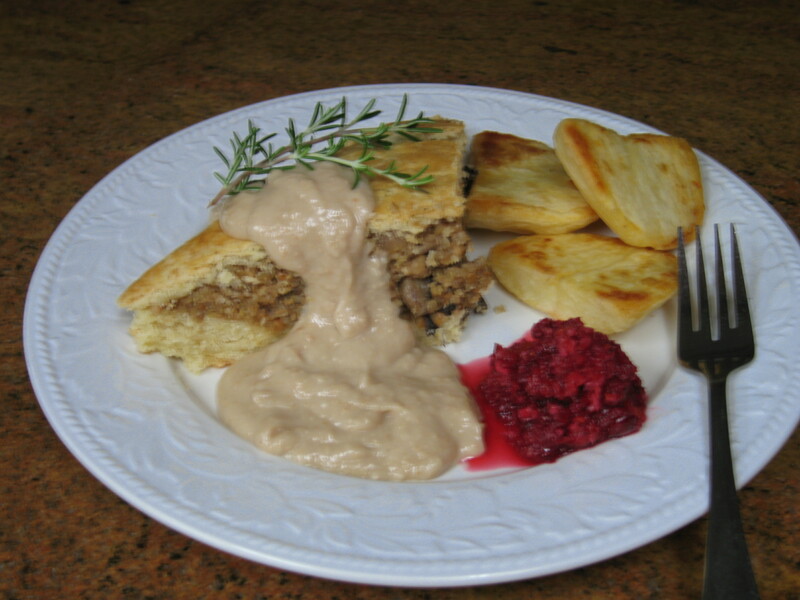 This sauce is lovely as a rich, thick, gravy style accompaniment to a roast dinner with roasted potatoes. It is a bit like a bread sauce in function. I like it thick, and the Braggs, along with the darker color of the roasted cashews, gives it a great, pale brown gravy color. Blend all ingredients together in a blender with 1 cup (8 fl oz) of water until smooth. Pour the sauce into a saucepan. Use another cup (8 fl oz) of water to rinse out the blender into the saucepan. Bring the sauce to a boil over a high heat, until smooth and thick, stirring frequently, especially towards the end when it is more likely to stick. Check seasoning, and serve hot.